How does an architect become a fashion designer and create a fashion brand business? 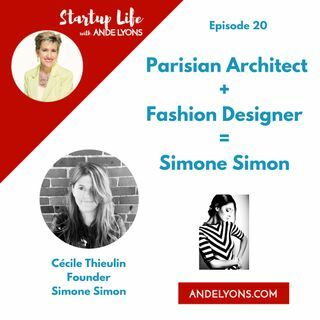 Our guest, Cecile Thieulin, shares her deep insights for launching a fashion brand, even when you've never stepped foot into the fashion industry. From fundraising to design decisions to manufacturing options - Cecile brings strategies and tactics for building a fashion brand. Her startup stories and advice will also resonate with business owners across all industries and with those who are dreaming of ... Más informaciones launching their own business. Cecile Thieulin was born in France, grew-up in Paris, studied in Barcelona and worked in New-Delhi, London and New-York before she settled in between Paris and Boston… where she works today. Because Cecile has always had a fascination for geometry, light and shadows, shape and spaces, cities and history, she chose to study architecture. In 2006, she started her own architectural business and, along the way … when she was looking for specific clothes she couldn’t find, she did what many women do. She decided to learn sewing and created her first pieces. When Cecile moved to Boston in 2016 she was inspired by the incredible energy of the city, and decided to launch a creative new space for fashion. Cecile’s fashion brand is called Simone Simon, based upon having seeing a movie with the actress Simone Simon wearing a spectacular striped shirt. Cecile was so inspired, she decided to play with stripes and lines (geometry) on the woman’s body to enhance body curves. Today Cecile approaches fashion like she would construction of a home or building, and uses her technical background to optimize the apparel fabrication process from creation, to prototyping, to manufacturing. If you need startup mentoring – please visit my website, http://andelyons.com where you’ll find all the ways I can add value to your startup journey – strategy calls, pitch deck and one page business snapshot coaching, WBENC application support for women business owners - I’d be honored to mentor you through whatever you’re going through – so please don’t hesitate to reach out. Thank you for tuning in and remember - you've got this Startup Founder!